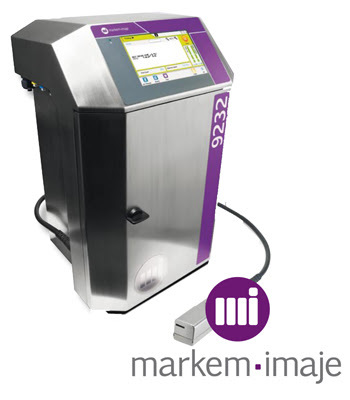 Markem-Imaje introduces on the marking and coding market a new small character inkjet printer: the 9232. This new printer translates the ability of Markem-Imaje to reinvent the standards of continuous inkjet technology and show its commitment via tangible facts to its customers. 9232 printer will be the flagship model of 9000 Series. It prints best before dates, logos, alphanumeric text, 1D and 2D barcodes for food, beverage, pharmaceutical, cosmetic, electronic, cable and extrusion industries. The 9232 allows for optimal and transparent management of overall printing activities resulting in enhanced cost control, environmental impact reduction, better printing results and optimization of operator’s time. 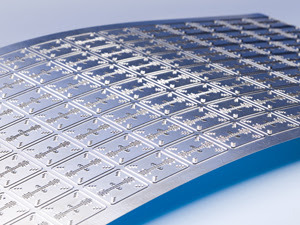 Increased performance is directly linked to its new ink circuit and its innovative printhead. The 9232 printer is characterized by a new touch screen user interface, comparable to the best on the convenience market today. Enhanced ink cartridge life to print up to 90 million characters per liter as standard. Additive consumption can be reduced by up to 2.5 ml/h at 20 °C depending on the conditions. Time between maintenance operations is extended to 18 months for standard applications. 18-month warranty for hardware in the conditions defined by Markem-Imaje. IP55 stainless steel cabinet requiring no plant air. New, revolutionary user interface with 7-inch wide color touch screen. Real-time display of remaining print capacity and tracking of consumption, printer availability and maintenance procedures. Fast, safe consumable changing, with no need to stop printing. Print speed of up to 6.6 m/s. Font height of up to 32 dots. Optional ultrarapid mode for high-speed printing. New multi-use ketone-free and MEK-free inks. Electric power is limited to 60 VA reducing power consumption. The new online Year in Review is titled "Inspired Brands. 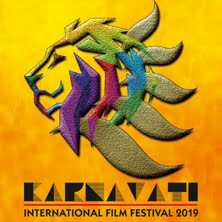 Intelligent World," reflecting the company's vision for achieving customer satisfaction and sales and earnings growth through innovative, high-performance materials, technology and solutions. 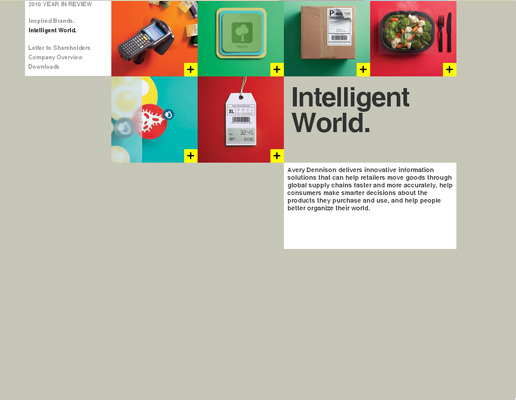 The engaging, interactive Year in Review showcases how the company is making brands around the world more distinctive and appealing and developing innovative information solutions that help businesses and consumers better organize their world. The Year in Review also notes the new names of one Avery Dennison business segment - Retail Information Services -- now known as Retail Branding and Information Solutions - and eight business units, all reflecting the increased external focus of the businesses. A chart showing the names is available at www.averydennison.com/2010review/businessnames. 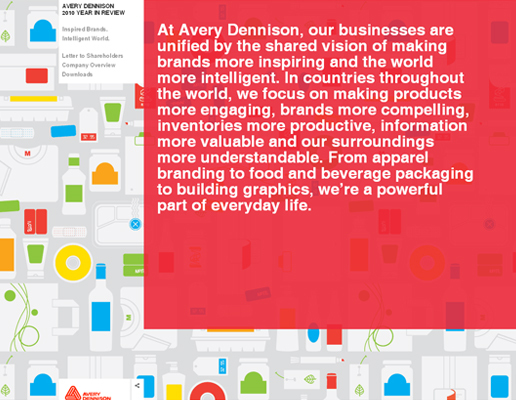 In his letter to shareholders, Avery Dennison Chairman, President and CEO Dean Scarborough notes, "Avery Dennison made solid financial and strategic progress in 2010. We improved our financial results, strengthened our balance sheet and ended the year positioned to return more cash to you. At the same time, we continued to invest in long-term growth and transform Avery Dennison into a trusted partner that makes every brand more inspiring and the world more intelligent." The company has presented its 2010 Year in Review in an online format separately from its annual report for shareholders. The company is following the U.S. Securities and Exchange Commission's rules for "notice and access" of annual meeting-related materials, and making its annual report and proxy statement available to shareholders at a specific Website for electronic voting, the address of which is being mailed to shareholders. Bill Poulson, a member of the Graphic Solutions unit at global anilox supplier Harper Corporation, will detail the advantages of laser engraved ceramic rollers during the ICE USA show in Orlando. A 34-year printing industry veteran, Poulson is Harper's Northeast Technical Graphics Advisor. He is a specialist in coatings and custom labeling and serves as a narrow web press trainer. Also, Poulson served as co-chairman of a session devoted to pressroom and production practices during an FTA Forum. The International Converting Exhibition (ICE) – scheduled April 6 - 8 – will feature three full days of tech presentations focused on web coating, web handling, package printing, converting processes and quality and measurement issues. More than 250 national and international suppliers will showcase their flexible material converting technologies and services. Poulson will be part of a final day look at measurement, quality and chemistry concerns in package printing and converting. He will compare the use of chrome rollers to laser engraved ceramic rollers. "Whether the application is flexographic or gravure, there are considerable benefits to making the conversion from chrome rollers to laser engraved ceramic rollers," Poulson said in advance of his speech. "There are parameters - volume and surface preparation - that must be maintained for the ceramic roller." The biggest key, according to Poulson, is knowing how chrome and engraved ceramic rollers react to each other. Release characteristics of ceramics are different. But once the variation is calculated, press operators can expect a huge payback in surface wear, he said. "This longer surface life of these [ceramic] rollers allows a slower wear curve which results in better consistency of coat weight throughout a press run," Poulson said. 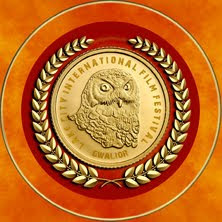 The Association of International Metallizers, Coaters and Laminators (www.AIMCAL.org) bestowed its 2011 Product of the Year Award on the Consumer Packaging Div. of Graphic Packaging International (GPI), Marietta, GA, for a series of oval holiday canisters for Kleenex tissues from Kimberly-Clark Corp., Neenah, WI. GPI, which has won top honors in this competition for the third consecutive year, served as converter on the project (shown alongside). The three-piece formed canister is designed by Kimberly-Clark to complement home décor during the holiday season. The sidewall structure consists of ultraviolet (UV) coating/UV inks/metallized polyethylene terephthalate (mPET)/0.016-inch solid bleached sulfate (SBS)/extruded low-density polyethylene. A proprietary process creates a lens pattern on the mPET. The resulting “ornaments” look so three-dimensional, the paperboard appears to be embossed. Registration marks in the film ensure the lens pattern aligns perfectly with the graphics. UV inks and coatings enhance shelf presence. 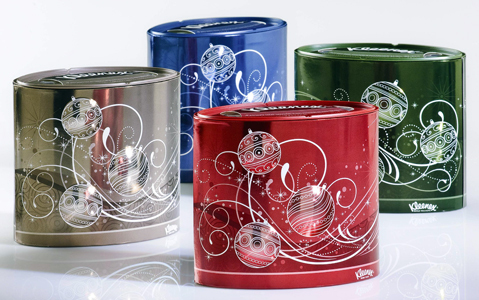 The upscale, holiday-themed canisters sell for $2.99 each, a significantly higher price point than standard tissue packs. The judges also named six category winners, which received either Marketing or Technical Awards. GPI also captured the Technical Award in the Food Packaging Category for a susceptor package it converts for Red Baron Fire Baked and Brick Oven Pizza Singles from Schwan’s Consumer Brands North America, Marshall, MN. GPI converts the overprint varnish/ ink/ SBS/ patterned adhesive/ paper/adhesive/mPET to create a functional susceptor patch lamination that eliminates warping of the front panel when it’s exposed to repeated freeze/thaw cycles. The warping not only made the package look less attractive on shelf, but also caused uneven cooking in the microwave oven. The key to preventing warping lies with the paper/mPET lamination and the adhesive pattern that attaches it to the SBS. The innovation extends package shelf life six months, presents a more appealing package, and enables more even cooking. Toray Plastics (America), Inc., North Kingstown, RI, supplies the PET film, which is metallized by Rol-Vac, LP, Dayville, CT.
Members of the judging panel were impressed by the shelf-life extension and warpage and waste reduction achieved by the pattern adhesive that attaches the suspector to the SBS. Since the adhesive creates open channels between the SBS and susceptor, humidity vents to the interior of the carton instead of passing through the paperboard, thereby minimizing warpage. The judges also cited the increase in line speed and reduction in waste as major technical achievements. 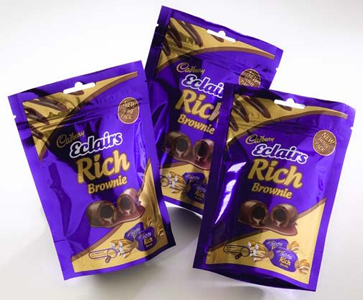 The Marketing Award in the Food Packaging Category goes to the Packaging Division of Uflex Ltd., Noida, India, for a PET/ mPET/ polyethylene standup pouch for chocolates from Cadbury India Ltd., Mumbai, India. 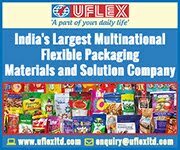 Uflex serves as a single-source provider as the substrate supplier, printer (rotogravure), metallizer, laminator, slitter, and converter. Plasma metallization enhances the lamination’s barrier properties. Added convenience is provided by a punched hole for hanging display and a press-to-close zipper. The judges noted the package design makes good use of the metallization. “The gold really makes the product look rich,” said one judge. “The graphics are mouthwatering,” observed another member of the panel. Category, Hazen Paper Co., Holyoke, MA, captured the Marketing Award. Hazen Paper served as the substrate supplier and metallizer for a holographic slip case for the Elvis 75th Anniversary DVD Collection from Warner Home Video, Burbank, CA. The slip case wrap consists of 60-gauge custom holographic mPET laminated to 80-pound, coated-one-side litho/label paper from Hazen. A two-/three-dimensional Holo-Lens insert adds a security feature. The custom hologram, a repeating pattern of the name Elvis, reflects the persona of the star as well as the integrity and pizzazz of the brand. The litho/label stock exhibits excellent lay-flat and stay-flat characteristics to support faster printing and die-cutting speeds. The PET helps prevent score cracking. Other participants in the project included Multi Packaging Solutions, Indianapolis, which served as the converter and shared design duties with Warner Home Video. The judges agreed the slip case is a superior integration of metallizing, holography, and printing. Registration between printing and holography is tight, and there’s great contrast between the printed images and words. “Well done,” they concluded. Hazen also won a Technical Award in the Decorative Display Category for a magazine insert publicizing its custom holographic capabilities and sustainable practices. Hazen served as designer, substrate supplier, metallizer, and converter for the Rose Among Thorns insert. The 10-point, coated-two-side paper features a custom, transfer-metallized hologram overprinted in four-color process plus opaque white. A UV coating protects the front and back of the page. Transfer metallizing helps the relatively lightweight insert lay flat because it permits moisture gain and loss on both sides of the sheet. Describing the insert as “really effective,” the judges noted how transfer metallizing provides source reduction because it eliminates a metallized film layer. It also offers superior aesthetics and minimizes warping because it allows the paper to breathe. In addition, the holograms are so appealing “you want to touch the page and feel the cracks,” commented one judge. The Marketing Award in the Decorative Display Category goes to FLEXcon Co. Inc., Spencer, MA, as the substrate supplier for indoor floor advertisements for Tecate beer from Heineken USA, New York City, Dunmore Corp., Bristol, PA, served as metallizer, and Performance Printing, Dallas, handled converting tasks. The base film consists of FLEXmark MMV 400 F Silver TC-848 A-109 94 PFW, a 4-mil, metallized silver, pressure-sensitive polyester/vinyl laminate. The metallized base film generates a shinier, more reflective metallic appearance than the previous structure, which relied on screen-printed faux metallic ink. In addition, the pressure-sensitive adhesive bonds strongly to floor surfaces, but removes cleanly for up to 180 days after installation. The surface-printed, four-color-process graphics are protected by FLEXmark OV6602, a 4-mil, clear gloss, pressure-sensitive vinyl overlaminate that resists delamination and meets industry standards for non-slip performance (ASTM D 2047). 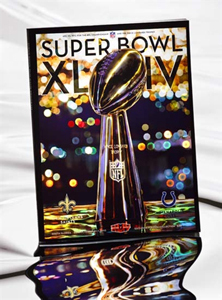 As its third win in the 2011 competition, Hazen Paper took home the Marketing Award in the Other Category for the holographic cover it designed, embossed, metallized, and laminated for the Super Bowl XLIV Exclusive Stadium Collection Edition program from H.O. Zimmerman, Inc., Lynn, MA. The custom hologram, featuring the Vince Lombardi Trophy, was transfer-metallized to 100-lb coated-two-side paper, which was then coated inline with Ultracure Acrylic. 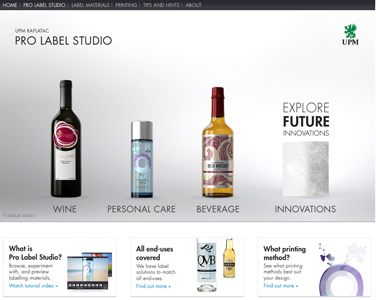 A new website for label and packaging designers - the Pro Label Studio by UPM Raflatac..
UPM Raflatac has launched a new website for label and packaging designers. Pro Label Studio presents visual examples and valuable information about the numerous possibilities that self-adhesive label materials offer for building brands and enhancing the shelf-presence of consumer products. 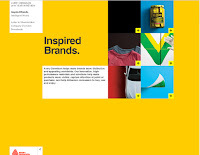 On the website, designers can learn about the challenges and requirements that different packaging materials, special effects and printing techniques place on label design and the choice of label material. Pro Label Studio helps designers select the right label materials for end-uses including wine, beverage and personal care labelling, and renders textured previews of selected designs and materials on various kinds of product packaging. By rotating the previews, users get a feel for how the selected combinations work in real life. For designers who want to create something new and exciting, Pro Label Studio presents Innovations: new materials that offer fresh combinations of colour and texture for innovative label solutions. ICE USA exceeds 250 exhibiting companies, many featuring running equipment..
With just a few weeks remaining before the inaugural ICE USA in Orlando on April 6-8, Show Management announced that it has exceeded 250 exhibiting companies and 50,000 square feet of sold exhibit space. This makes ICE USA the largest converting-exclusive event in North America since 2007. Hats off to the converting industry for such a strong turnout. We are thrilled that the exhibitor support has been so solid for our first show in North America, said Event Director Michael Boyle. The quality is there and the focus is right. On top of that, the international mix of exhibiting companies, from Europe, Asia and the Americas, is the best of any ICE show ever – and that is saying a lot, as there have been many glorious ones in the past twelve years. Also, we are especially excited that dozens of these companies will be showcasing equipment on the show floor. Among the exhibitors featuring running machinery are New Era, Comexi, Kampf, Ashe, Jennerjahn, Atlas, Deacro, Soma, Guidolin, Lever, Parkinson Technologies, Elite Cameron, Vacuumatic and CMC Cevenini. John Godbold, CEO of slitter rewinder specialists Ashe Converting, summed up the current mood among machinery suppliers: "If we believe in a show, we always take and run machinery. We are really looking forward to the launch ICE USA and anticipate seeing a lot of decision-makers in Orlando." PPP Digital Imaging now offers ITR Multi Sleeves, a system that allows individual coils to be supplied instead of full length sleeves. This provides the flexibility to mix and match the coils as needed. 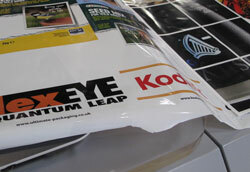 PPP says it is ideal for composite print. The company has also moved into HD Imaging for flat plates and ITR sleeves. PPP Digital Imaging has been supplying design, repro and flat polymer printing plates to the packaging industry for many years. Eighteen months ago the company moved into production of round polymer sleeves. PPP says switching to ITR adds value due to more efficient presses and faster runs, thereby increasing productivity. There are no tape and mounting costs. Staffed by a team of highly motivated and experienced reprographic technicians, whose expertise encompasses all areas of print, PPP Digital Imaging produce the highest quality digital flexographic, Gravure and Lithographic reprographics, ranging from labels to flexibles and pre-print to post-print. 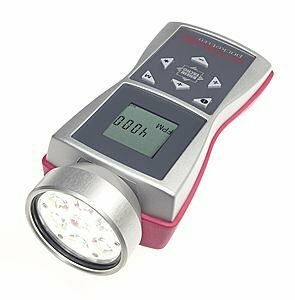 Rheintacho has unveiled a new series of LED stroboscopes for stationary use with the RT Strobe LED 3000, 5000 and 7000 models. This series complements the RT Strobe series, which uses Xenon technology and is already established in the market. Compared to Xenon stroboscopes, the LED series models are designed for various inspection widths. This is accompanied by greater light intensity depending on the inspection width. The RT Strobe LED 3000, 5000 and 7000 models offer inspection widths of 300mm, 500mm and 700mm respectively. Greater widths than 700mm are illuminated by using a number of these stroboscopes connected together, controlled by one control unit. Stroboscopes are versatile instruments for the visualisiation of very fast movements. They are important and necessary tools for the inspection and control of machines and manufacturing lines eg in printing or textile industries. Stroboscopes could also be used for the non-contact measuring of rotational speed. If the stroboscope flash frequency matches the frequency of movement, the test object appears stationary. It can be observed and its frequency of movement recorded. Rheintacho offers stroboscopes in different design and technologies. For every single application the right tool for you. Rheintacho says that the improving performance LEDs is now allowing for the development of stationary models that present serious alternatives to xenon models with regards to both performance and commercial aspects. Both machine signals and the signal from a control unit can be used simultaneously thanks to the connections available in the series. The switch between the two inputs is performed by rocker switch on the back of the stroboscope. An option for regulating light intensity is included, even in the standard version of the RT Strobe 5000. According to Kodak the company has licensed digital imaging technology to Nokia, LG, Motorola, Samsung, and Sony Ericsson. Bloomberg reports Kodak used the ITC to gain $550 million from Samsung and $414 million from LG for allegedly infringing the same patent as in the Apple and RIM cases. German cutting tool manufacturer Wink has extended its range of finish variants for cutting tools. Its existing Black and Silver non-stick variants have been improved, while the new White and Grey variants have been launched. Wink’s non-stick coatings can be used for flexible dies, solid rotary dies and other machine components. The non-stick coating makes it possible to increase production efficiency significantly when cutting ‘extreme’ adhesives, says the company. Non-stick coatings for flexible dies have long been part of Wink’s product portfolio. Their repellent action against adhesive and ink residues means that cutting tools stay totally clean, especially on the cutting lines. This not only minimizes cleaning costs, but also increases production speed and efficiency. Because of the non-stick coating, hardly any labels adhere to the web or tool after cutting, which significantly increases the production rate. The coating does not in any way affect the flexibility, magnetic adhesion and precision of the flexible dies. In close cooperation with material manufacturers and customers, the Wink research department conducted a series of tests in order to fine-tune all the variants to the needs of printers. This ultimately led to the development of four non-stick variants, each of which is recommended for specific main applications. The grey variant (Grey) is an all-round product for difficult materials. It stands out for its optimum non-stick effect, which makes it suitable when using flexible dies with multi-layered labels and hot melt adhesives. The white silicon-based non-stick coating (White) is the best option for coating solid rotary dies, but can also be used for flexible dies. Just like Grey, the White variant has optimum non-stick properties, even when using ‘extreme’ materials, and also provides added protection against ink residues. Wink recommends its silver version (Silver) as a non-stick protection for accessory products, such as ink troughs and guide rollers. The special ink-repellent effect of the Silver coating makes the machine components significantly easier to clean. Silver is also suited to Wink protector plates, which are used in sheet-fed offset printing machines. In addition, the Black, Grey and White variants can be combined with Wink MC coating and laser hardening, thereby maximizing the life of flexible dies. Wink is represented in India by Shilp Ultratech. Nuova Gidue has introduced two new press lines for the production of lottery tickets, shrinkable sleeves and cigarette boxes. The LTO line includes a new unwinder/rewinder for reels up to 1,500 mm wide and heavy duty offset print units to produce labels and packaging at speeds of 200 m/min. The LTO print unit is designed to produce minimum waste due to its short web path and high level of automation. It includes automated ink control and the PrintTutor camera system for ‘intelligent’ register set-up. The LTF line includes newly developed flexographic print units for drying high volumes of water-based inks with limited energy consumption. The LTF flexo unit project follows eco-friendly requirements: reduced web path, automated set-up operations and reduced energy consumption. The LTF line can dry heavy deposits of inks and glues at high speeds, with half of the energy consumption required on other inline presses, claims the company. The first LTO and LTF presses have been installed at Bei Jing Printing Second Factory in Beijing, China. The two presses are 530 mm wide: a 5-color UV offset LTO; and a 14-color air/IR Flexo LTF, plus inkjet digital printing from Kodak. The design of the LTF press, with double over-dimensioned chilled drums for each print unit, is said to allow excellent register performances on most substrates, also in second-pass mode. Soma Engineering has launched its second generation automatic rewind tension control system, Tenzomat II. This option is available for the company’s complete range of slitter rewinders and enables a wider spectrum of flexible packaging materials to be handled. Precise rewind tension control is achieved through load cells linked to a PLC to measure tension values at each working station. These values are subsequently compared through special software to pre-set targets and any deviations are corrected through changes in the pressure inside the rewind shafts. This enables precise rewind tension control during the entire rewind cycle. Tensomat II allows for variations in the width, thickness and diameter of rolls to be processed and enables the user to process a wider range of materials with top quality finished reels. Ease of operation is through touch screen control and entry of the job parameters that include rewind roll width, lay on roller weights and material thickness. The system is equipped with software that stores recipes for repeats jobs. 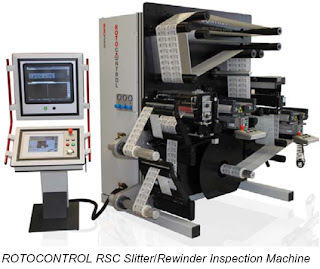 Rotocontrol has received a purchase order from Reynders Pharmaceutical Labels NV, in Belgium, for an RSC slitter/rewinder equipped with an AVT Helios 100% Inspection System. Three other slitter/rewinder inspection machines were previously purchased from the company by Reynders Etiketten NV, also located in Belgium. The new machine will include a vacuum splice table with integrated waste wind-up at the vertical inspection area, a recently released option available on all Rotocontrol RSC slitter/rewinder and RSP Single Pass 100% Security inspection machines. Marc Reynders, CEO of Reynders Label Printing commented, 'Our current investment of three Rotocontrol inspection machines has proved very beneficial for label production at Reynders Etiketten NV. Significant growth within Reynders Pharmaceutical Labels NV resulted in a need to expand our slitting/rewinding and inspection capacity, and we naturally opted to invest in another machine from the company'. Kodak announced a $100,000 donation to the International Red Cross relief efforts helping survivors of the earthquake and tsunami in Japan. The donation will be made directly to the International Red Cross from Kodak’s Japan offices in Tokyo. Kodak’s operations in Japan include sales, customer service and support, and manufacturing. There were no injuries among Kodak employees and their families in Japan. 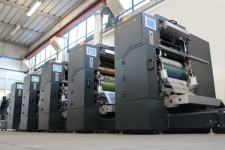 Enfocus will present its innovative automation and PDF preflighting solutions at digi:media 2011, a new trade fair for commercial and digital printing professionals under the theme of 'Content meets Technology meets Business'. Enfocus’ latest solutions fit perfectly with the theme, with the company running demonstrations of Switch and PitStop Connect. digi:media takes place in the Messe, Dusseldorf, 7- 9 April. Enfocus can be found in Hall 6 on stand C22-1. Martin Werder, Managing Director at Impressed, adds: “We are pleased to partner with Enfocus and look forward to supporting them at digi:media 2011. By running joint demonstrations, we can show delegates how easily the Enfocus automation and preflighting solutions can be integrated with third-party applications. At the show, we will also present InDesign Connect, a brand new development that connects the InDesign Layout Desktop directly to a Switch-based workflow." Enfocus is to showcase Switch at digi:media 2011. The solution enables commercial and digital printing professionals to automate repetitive tasks, standardize their work and reduce errors. Configurators make the process even simpler, allowing users to integrate applications they already use and automate third-party software application tasks without manually launching those applications. The Switch product family includes three versions, with an easy upgrade path among the three: the entry-level LightSwitch, FullSwitch that includes configurators to easily integrate with third-party applications and PowerSwitch, which extends the automation even further through custom scripts and meta data support (incl. JDF, XMP and XML). Another solution on display at digi:media 2011 will be PitStop Connect. PitStop Connect is an easily set-up single gateway for file transmission between graphic designers and printers or publishers. All types of files can be delivered, including metadata that goes along with the file, such as an order identity, quantity or format. It ensures that all files the user receives are according to his specifications and transferred directly into his workflow. PitStop Connect can also be used to preflight PDF files upon delivery, using Enfocus bulletproof PDF preflighting and correction technology within a Connector. Problems such as missing fonts and low-resolution images are detected and if possible even corrected automatically. 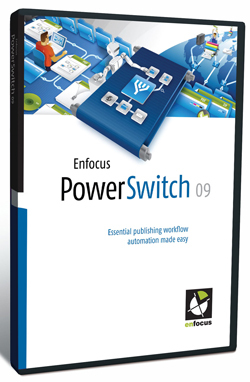 Connectors enable file delivery to an FTP or directly into an Enfocus Switch automated workflow. The latest version of PitStop Connect 09 further streamlines communication by providing support for updating Connectors and live feedback during operations. FINAT, the European association for the self-adhesive label industry reports that demand for self-adhesive label materials in Europe has continued its strong recovery in 2010. From the all time lows recorded at the peak of the global financial crisis in mid 2009, demand returned to pre-crisis levels in the course of 2010. Last year, an overall volume of around 5.7 bln. square meters was recorded, an increase of 11.4% compared to 2009 and 3.5% above the level recorded in 2007, the year before the collapse of global financial markets. Underlying this growth was the strong, 9.5% recovery of the demand for rolls of paper based label materials, representing some 70% of total demand for self-adhesive label materials. Exceeding this growth, however, was the increase in demand for filmic roll label materials (PE, PP, others), which amounted to 15.3% over the previous year. Filmic materials thus resumed their rise in the share of European self-adhesive materials demand and this from just over 15% at the beginning of the decade to over 22.5% in 2010. Geographically, growth in demand was driven by Eastern and Southern Europe (including Turkey). Both regions recorded healthy double digit growth figures of 20.6% and 13% respectively. Within these regions, Turkey, Russia, Bulgaria and Romania stood out with annualized growth (well) in excess of 20%, a sign of strong economic development in this emerging region. In the more matured regions, growth of self-adhesive label demand was more modest at around 4.5 - 8.5%, although double digit growth figures recorded for Germany, The Netherlands, Italy and Spain ranked above the top end of this range. This healthy recovery does not come without significant future risks and concerns however. Already in the late summer of 2010, FINAT members expressed concerns about disturbances in the supply chain that were building up pressure on raw materials' market conditions. According to Finat's quarterly member survey, this prospect tempered the optimism of executives at the beginning of 2011, although the balance of respondents continued to be positive about business prospects for the industry. Over the past three to four months, the pressure on raw materials has aggravated. Between January 2010 and January 2011, the benchmark pulp prices increased between 20-25%, while resins for LDPE, PP and PET, crucial to filmic label materials, increased between 25-35%. 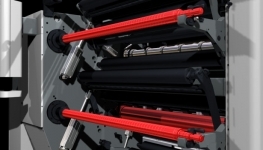 Polymers necessary for the production of adhesives, even increased by 65-75%. Also ink suppliers are being faced with the impact of tight raw materials' markets and have announced price increases ranging up to 30%. The rise of crude oil, driven by the uncertainties in the Arab world, is further intensifying the pressure, not in the least because of the increase of related transportation costs. EskoArtwork is showcasing how its sophisticated suite of digital flexo, workflow automation and pre-production solutions help customers competitively enhance their production at Gulf Print & Pack on stand C760. Gulf Print & Pack takes place at Dubai at Airport Expo, from March 14 to 17. Suite 10 with integrated software solutions for packaging prepress, 3D structural design and quality assurance, collaboration and automation, and color management. Visitors can follow demonstrations of the Automation Engine 10 and version 10 releases of all editor applications: ArtPro 10, PackEdge 10, DeskPack 10, ArtiosCAD 10 and Studio 10. Integrated more than ever, Automation Engine 10 adds capabilities to the automation of repetitive tasks, and takes the human interaction out of the pre-production process. This avoids mistakes and saves considerable time and money. Packaging expertise with HD Flexo 2.0, which has been designed to help customers maximize their production capabilities, ensuring high quality and consistent flexo printing. 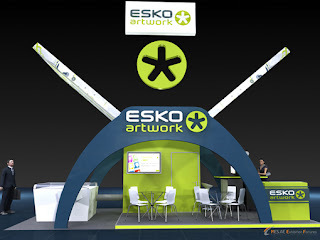 It combines 4000 dpi HD optics on the EskoArtwork Cyrel Digital Imager (CDI) with advanced MicroCell screening technologies to produce sharper and more accurate imaging. The new version is an evolution of EskoArtwork’s patented PlateCell technology and provides higher solid ink density (SID) for more vibrant colors on packaging while printing with standard flexo inks and anilox rollers. Versatility of substrate choice is one of the benefits demonstrated by the small format Kongsberg i-XE10. The high precision digital cutting table provides an efficient and adaptable digital finishing solution for short-run production of a variety of visual communications including sign and display and labels. basysPrint UV-setter 850 on show at Gulf Print & Pack..
At the Gulf Print & Pack show (14 - 17 March at Airport Expo, Dubai), basysPrint featured its manual UV-Setter 850 series solution for conventional plate exposure. The success of the basysPrint UV-Setter family, of which over 200 units were sold in 2010, proves the undeniable advantages of combining the latest in CTP technology and the wide choice of proven conventional printing plates. Keywords are cost efficiency, quality, modularity, and sustainability. "Rather than locking our customers into a specific plate technology, the basysPrint approach allows them free choice of plate types and plate suppliers, with over 60 plates of more then 15 suppliers. UV plates today still have a good price advantage over other CTP plates. And its leading chemistry is compatible with multiple plate brands to standardize plate processing and reduce cost, " says Christophe Lievens, Director of Sales and Marketing at basysPrint. "We welcome the opportunity to highlight our UV-Setter family and CTP technology to visitors at Gulf Print & Pack". With the basysPrint UV-Setter 400 and 800 Series the keyword is modular flexibility. An existing manual installation can be upgraded to become a fully automatic system at any later time, with either a single- or multi-cassette plate loading system. Light modules containing latest generation violet diodes can be multiplied to enhance exposure speed: the more light modules you combine the faster the plate exposure. The basysPrint UV-Setter offers ecology friendly processing chemistry. It is a low alkali, soap like solution that can be poured down the drain. There is no contamination with heavy metals, silicones or other hazardous components. The chemistry consumption is very low (20-50 ml per m²). On top of that, the system presents a very low energy consumption (2KWH versus 8.3 KWH with thermo plates). Karstedt Associates, Ltd. is pleased to announce the immediate availability of the much anticipated Commercialization Assessment Report prepared specifically to assist the Narrow Web Label Printer/Converter in evaluating technologies and opportunities for digital label printing. 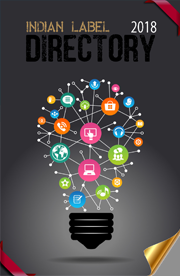 This report is produced in collaboration with Mike Ferrari of Ferrari Innovation Solutions, LLC and is the first in a series of planned business analysis and decision tools, several others will be coming over the next few months. Unlike "traditional" market evaluations, Commercialization Assessments are designed to provide actionable input on how digital print technology can be applied in your existing workflow, their overall positioning within your product mix, and provide insight on how your customers may perceive and respond to your expansion in this area. Enter your own operating parameters, including production costs, product mix, existing print technologies, equipment, and more. e.g. Wondering what the impact of adding a digital press to your workflow will be on your bottom line? Create your own cost/ROI scenarios to help you determine the best approach for your operations. Xeikon announces the further expansion of its dealer network in Asia Pacific with the appointment of Pt Tosi Jasindo as Xeikon distributor in Indonesia. By partnering with one of the region's leading distributors, Xeikon positions itself to capitalize on the growth potential of the Indonesian market. Under the terms of the distribution agreement, Tosi Jasino will support Xeikon in the label and packaging printing market, by providing sales and service support for the Xeikon 3000 Series and it’s solutions for the label market. 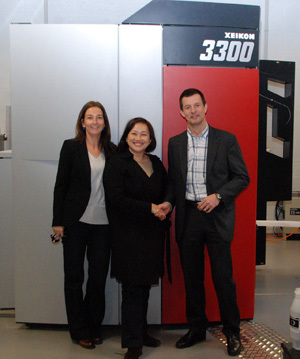 Following a thorough review of the opportunities presented by the rapidly expanding Asia Pacific region, Xeikon continues its strategy to strengthen its presence. The appointment of Pt Tosi Jasindo is a next essential step of this approach. Pt Tosi Jasindo has several years of experience in selling label presses and decoration technologies in Indonesia. “This makes Tosi Jasindo the best positioned partner for Xeikon in a market that has good potential,” states Hans Gerinckx, Sales Director Industrial Printing at Xeikon. Eastman Kodak Company has completed its previously announced acquisition of substantially all of the assets of the relief plates business of Tokyo Ohka Kogyo Co., Ltd. TOK . The acquisition expands and enhances Kodak’s capabilities to serve customers, particularly in the packaging industry, a key growth segment for the company. This newly acquired business is now a part of Kodak’s Prepress Solutions business and will conduct business under the name of Yamanashi RPB Supply Company. The relief plate business includes flexography, letterpress, Braille and molding plate products produced and marketed by TOK worldwide. Included in the acquisition agreement is a manufacturing plant and development facility located in Yamanashi Prefecture, west of Tokyo, which produces relief plates. The approximately 100 employees who were part of TOK’s relief plates business, most of them located in Yamanashi, have joined Kodak. “We are delighted by this opportunity to add TOK’s talented employees to our existing team for the benefit of our customers and shareholders,” said Edwards. 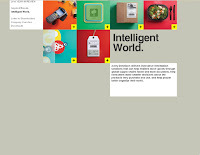 Kodak is a worldwide leader in the printing plates market, with a portfolio that includes digital offset plates, flexographic plates, and analog offset plates, which are part of Kodak’s comprehensive family of prepress solutions, including computer-to-plate devices, proofing solutions, plate processing equipment, and workflow. Kodak has been steadily expanding its portfolio to offer complete solutions for packaging customers, including the award-winning Kodak FlexCel NX Digital Flexographic System, Kodak Prinergy PowerPack Workflow, and the Kodak Approval NX Digital Color Imaging System. Aimed at the food, beverage and personal care segments, UPM Raflatac has recently launched its RafBio range of biodegradable cellulose films, PLA films, and paper faces combined with the company’s new biodegradable adhesive RP 55 Bio. The RafBio cellulose films in Clear, White and Silver are made from renewable wood-pulp from managed plantations. They are sustainably sourced and home-compostable. Cellulose films are top-coated for good printability. The RafBio PLA films in Clear and White are derived from corn starch and are suitable for direct food contact and are designed to offer versatile options compliant to EN13432, the European standard for compostable packaging. 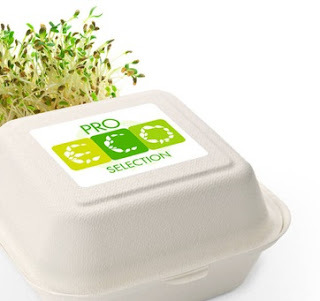 These industrially compostable PLA films have naturally good printing properties, excellent scratch resistance and higher levels of transparency and gloss, says the company. They also offer resistance to moisture, fats and oils. The newly launched RP 55 Bio adhesive has been formulated for sustainability and biodegradability. It includes a high content of renewable (non-fossil derived) materials. RP 55 Bio is available with the biodegradable films as well as two paper faces: Raflacoat Plus and Thermal ECO 300. Most papers can be classed as chemically unmodified materials of natural origin, and can be accepted as biodegradable without testing. RafBio films are also supplied with UPM Raflatac's RP 37 adhesive. The adhesive itself isn’t biodegradable, but adhesive and ink amounts below 1 percent of the total packaging are ‘considered negligible’ under EN 13432, according to UPM Raflatac. RP 37 is water resistant. UPM Raflatac has also introduced a face material for tamper-free packaging. 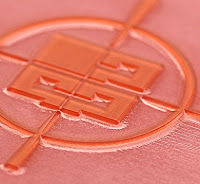 Holo Security is a metalized paper material with integrated holographic effect, which the company says can replace cost-intensive hot stamping on-press, yet has the same advantage of being hard to reproduce. The lacquered face assists a good overprint with conventional printing techniques and thermal transfer. Holo Security is at its best on sealing labels for luxury and consumer goods packages as well as in logistics and transport applications. An even higher degree of protection can be reached by adding security die-cutting on the printing press. OMET's open house to conclude today..